Representative Welch is always hard at work addressing issues that matter to your community. Check below for upcoming events to find out how you can get involved. Follow Rep. Welch to stay up to date. Parade steps off at 9:30AM. Please arrive one hour early. 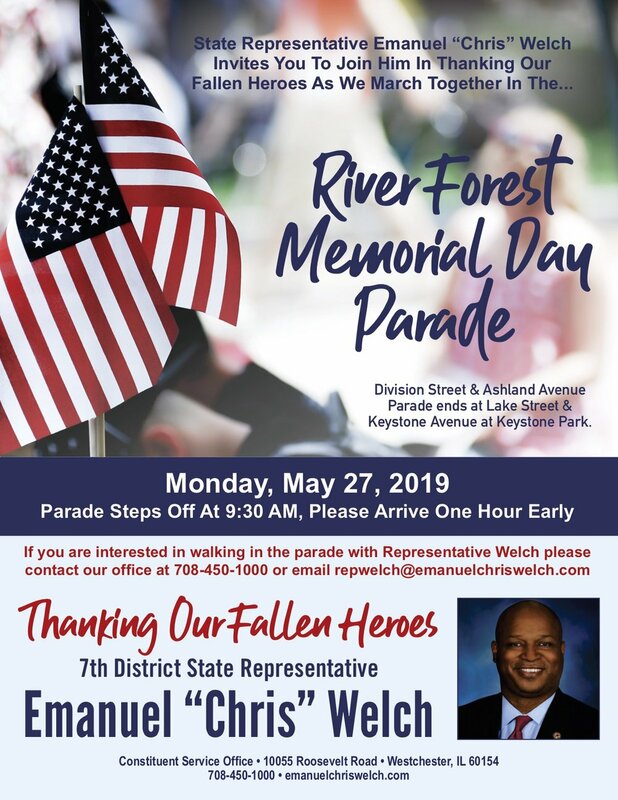 State Representative Emanuel “Chris” Welch invites you to join him in thanking our fallen heroes as we march together. Help protect yourself from identity theft! Bring documents that contain your personally identifiable information – such as old bank statements, tax returns, bills, receipts, credit card applications and outdated medical records – to be safely shredded. 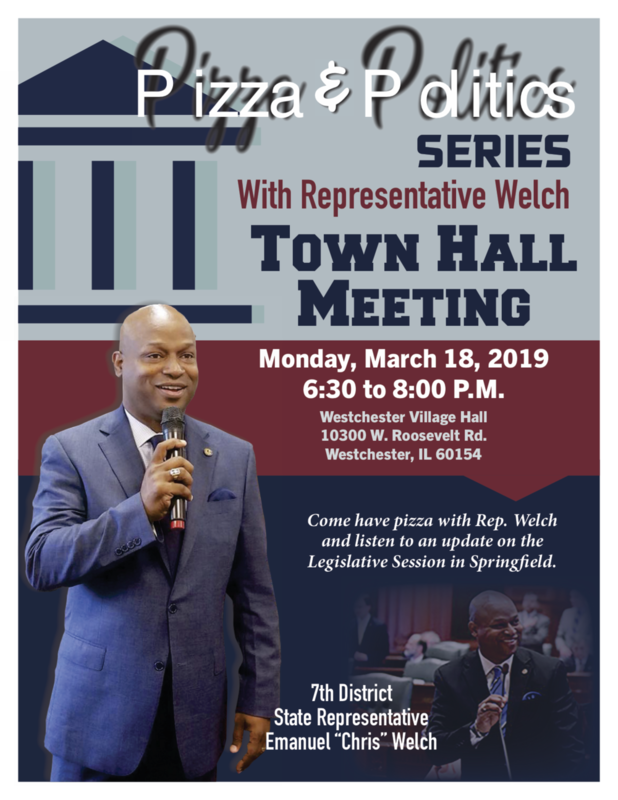 Come have pizza with Rep. Welch and listen to an update on the Legislative Session in Springfield. As one of the fastest-growing industries in Illinois, Hospitality and Video Gaming companies are continuously looking for highly-motivated, skilled and qualified candidates to fill a variety of important roles and positions within each business enterprise. 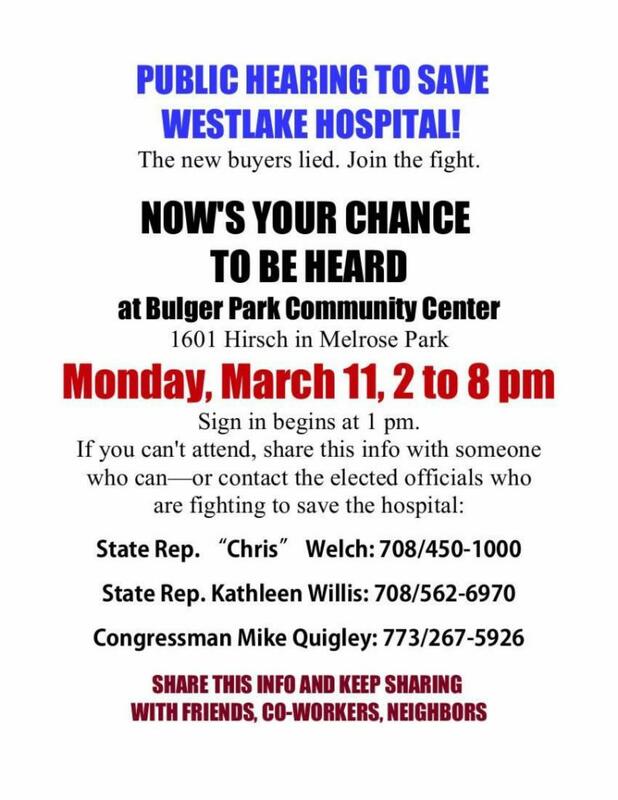 Public hearing to save Westlake Hospital. The new buyers lied. Join the fight. Kick off the new year right as Rep. Welch and our local trainer help you find the right health and fitness activities to make 2019 a brand new you! Join us and our sponsors to give back and give thanks! Visit our health and nutrition vendors and pick up great food at the Thanksgiving Food Giveaway. If you meet the requirements for Automatic Expungement and are interested in getting your juvenile record expunged as well as obtaining your state ID, join us for the Clean Slate Summit to start your life over and walk out with a clean slate. Visit with vendors and service providers for free health screenings and resources for seniors and veterans, including free help with drafting wills and estate plans. Have a great idea for a small business but not sure where to get the support to start? Join Rep. Welch and the Illinois Bankers Association for an instructive seminar. 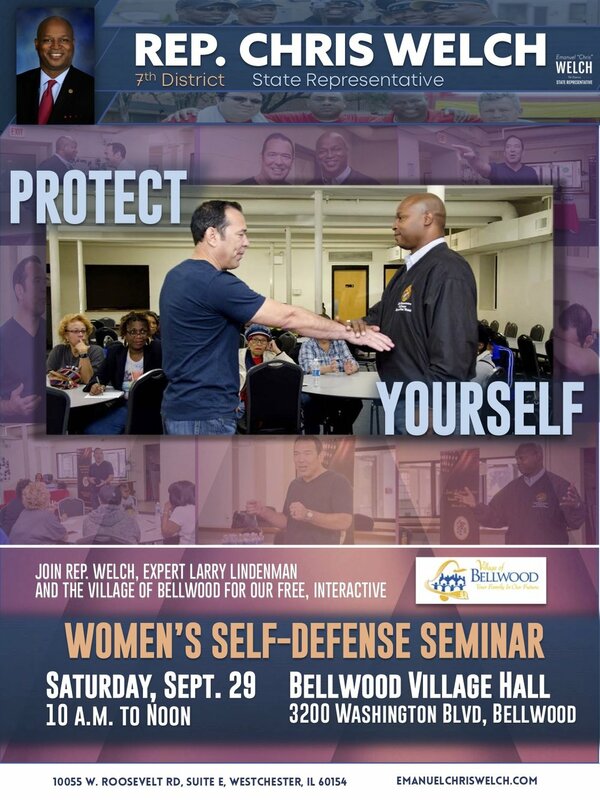 Join Rep. Welch, expert Larry Lindenman and the Village of Bellwood for our free, interactive Women's Self-Defense Seminar. Please join Rep. Welch and our team for a panel discussion on proposed bills important to veterans health. 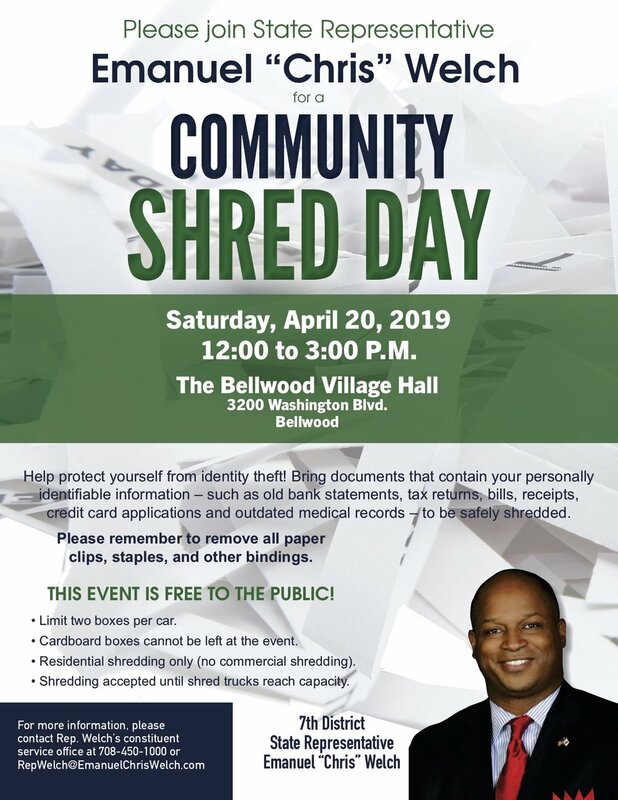 Please join State Representative Emanuel "Chris" Welch for a Community Shred Day. Help protect yourself from identity theft! Bring documents that contain your personally identifiable information - such as old bank statements, tax returns, bills, receipts, credit card applications and outdated medical records - to be safely shredded. We stand with Labor! 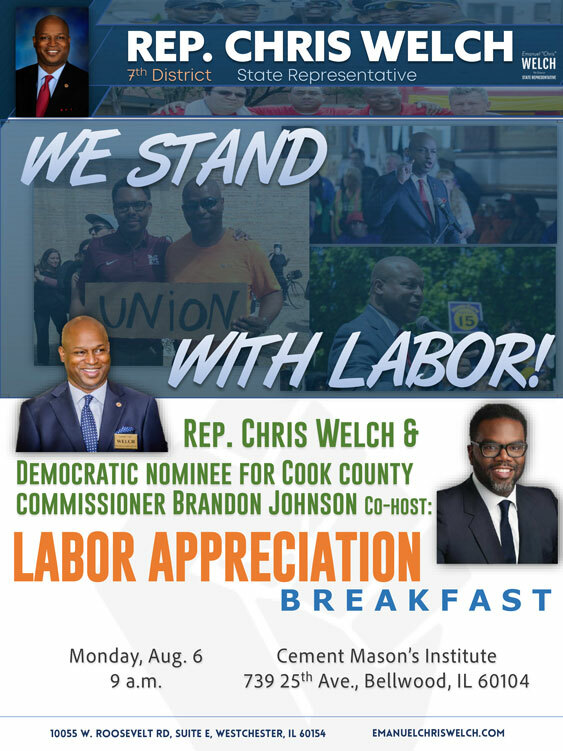 Rep. Chris Welch & Democratic nominee for Cook Country Commissioner Brandon Johnson co-host: Labor Appreciation Breakfast. Get a head start on the new school year with a variety of local service providers offering important health and wellness resources for children and families. Learn how to pay your fair share by appealing your property tax assessment. Please bring your latest tax bill and a valid state ID or driver's license to the workshop if you are interested in filing an appeal. Some in our communities have made mistakes and are ready for a second chance. The Summit of Hope is a community expo that brings together local service providers like you to help those on parole and probation to get the support they need to turn their lives around. 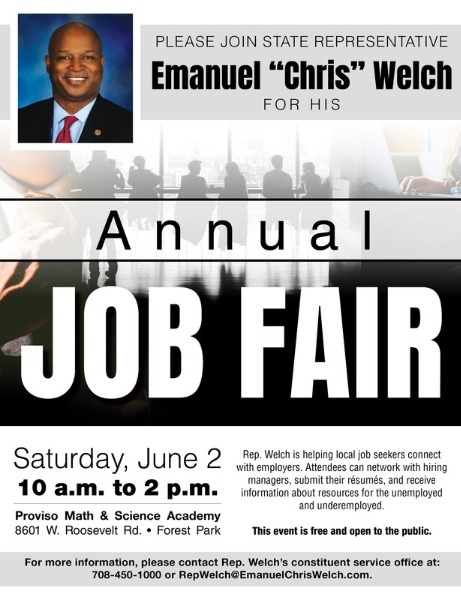 Please join State Representative Emanuel "Chris" Welch for Annual Job Fair. Rep. Welch is helping local job seekers connect with employers. Attendees can network with hiring managers, submit their resumes, and receive information about resources for the unemployed and underemployed. This event is free and open to the public. You are invited to a Veterans' Health Town Hall Meeting with State Representative Emanuel "Chris" Welch. Rep. Welch will host a panel discussion to hear your thoughts on proposed bills concerning important health issues facing veterans, including alcoholism, drug dependence and access to healthcare. Sign up with your first name, last name, and email address below. Contact State Rep Emanuel "Chris" Welch to learn more about his mission or upcoming events! © 2019 State Representative Emanuel "Chris" Welch. All rights reserved.